Ohio University will be the nation’s best transformative learning community where students realize their promise, faculty advance knowledge, staff achieve excellence, and alumni become global leaders. Ohio University holds as its central purpose the intellectual and personal development of its students. Distinguished by its rich history, diverse campus, international community, and beautiful Appalachian setting, Ohio University is also known as well for its outstanding faculty of accomplished teachers whose research and creative activity advance knowledge across many disciplines. Undergraduate major programs, preprofessional, and professional programs prepare students for employment in a variety of careers and for continued study. Two–year technical and associate’s degree programs, reflecting employment opportunities, as well as the general career interests of students, are taught primarily at the regional campuses. Ohio University believes that first–year students should be presented with a common set of curricular and cocurricular learning opportunities that introduce them to the intellectual skills, ethical norms, and civic values that will prepare them to succeed as scholars and citizens of the university community. Ohio University is committed to promoting academic, social, and personal engagement in that community and to ensuring continual improvement in the quality of the first–year experience through systematic assessment of student learning and involvement, academic practices and policies, and the availability and efficacy of support services. The University has statewide responsibility for an extended academic program using independent and distance learning. Vision statement updated January 2011. 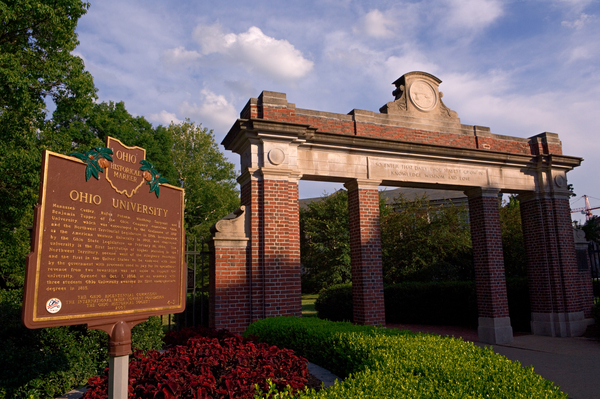 Ohio University was chartered by the state of Ohio in 1804 and is the oldest university in the Northwest Territory. Located in the scenic Appalachian foothills of southeastern Ohio, its classic residential campus is one of the most attractive in the nation. The charm of tree-lined brick walkways on the university’s College Green makes you feel as if you are at a small college rather than a large university. One can walk between most campus buildings within about 10 minutes. It is possible to live a mile away from the university buildings in a residential neighborhood and walk to work, or to live on a farm within a 20 minute drive. The city of Athens is surrounded by a patchwork of hardwood forests that constitute the Wayne National Forest. Under the new 2015 Carnegie Foundation for the Advancement of Teaching classifications, Ohio University is designated a Doctoral University (higher research activity) under the Basic Classification category. Only 107 schools - 2.3 percent - of the 4665 schools assessed by the Carnegie Foundation are classified as a doctoral university (high research activity). Ohio University’s institutional peers are all classified as either a doctoral university (highest research activity) or a doctoral university (high research activity). Ohio University’s roots are in post-Revolutionary War America. In 1786 a group of veterans petitioned Congress to purchase, through the Ohio Company of Associates, one-and-a-half million acres north and west of the Ohio River. Revenue from two townships in the Ohio Company purchase was set aside for support of a university. In 1808 the university opened with three students, and in 1815 awarded its first two bachelor’s degrees. The university graduated a total of only 145 students until after the Civil War. By 1920 it had 1,072 students, but it was not until after World War II that the university began to approach its present size. In the 1950s the student population grew from 4,600 to 8,000, and the 1960s saw enrollment burgeon from about 10,000 to some 18,000 students on the Athens campus. In the early 1970s, during the Vietnam era, the student population fell below 13,000. Today the Athens campus serves over 24,000 students. Since 1946, the university’s service as the major educational and cultural institution in southeastern Ohio has included regional campuses in Chillicothe, Ironton, Lancaster, St. Clairsville, and Zanesville. Today, the regional campuses collectively enroll over 8,000 students, making the full-time, part-time, and eCampus unduplicated enrollment for Ohio University over 36,000. University actual expenditures total nearly $738 million for all of its operations on all of its campuses. Ohio University is the largest employer in Athens County, with an annual payroll exceeding $451 million.